If you find that you constantly refer to the website to look at the DVIDA manuals & videos, you should add a shortcut to your home screen. This is a great way to get quick access to the website. It’s very easy to do and by adding this shortcut icon, you’ll never have to type in the URL again. Tap the Share button. It’s the icon that looks like a box with and arrow shooting out the top. Give the icon a name. A window will appear that allows you to edit the name of the website. Press Add. Tap the three dots at the top-right of the Chrome window. Edit Name, then select Add. 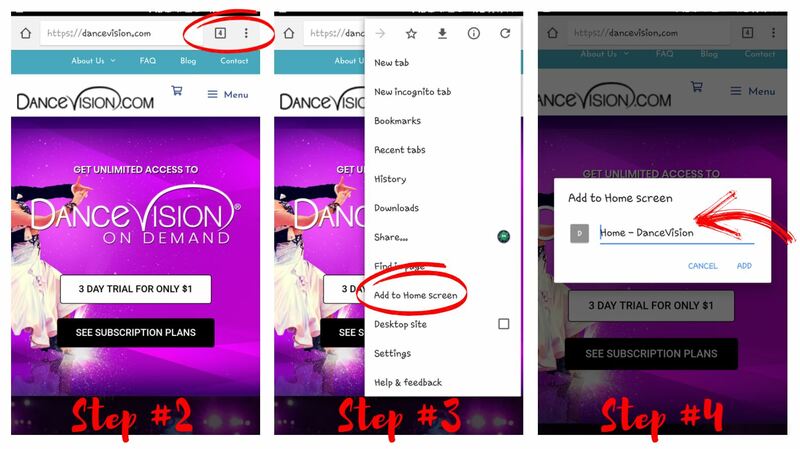 An icon for Dance Vision will now appear on your Home screen like an app. So the next time you’re at the studio and need to review some Tango figures, you’ll be able to quickly get to the website. Happy Dancing! Blackpool Dance Festival is LIVE! We can’t wait to see the turnout this year! Don’t miss another second, join the live stream now. Running May 24 – June 1, 2018.